Kitchen counter gardens are hot right now. They let you grow herbs, flowers and even some veggies with hydroponics and there are many brands and models out there. So what’s it like to use one? I received a Miracle-Gro AeroGarden as a gift for Christmas. 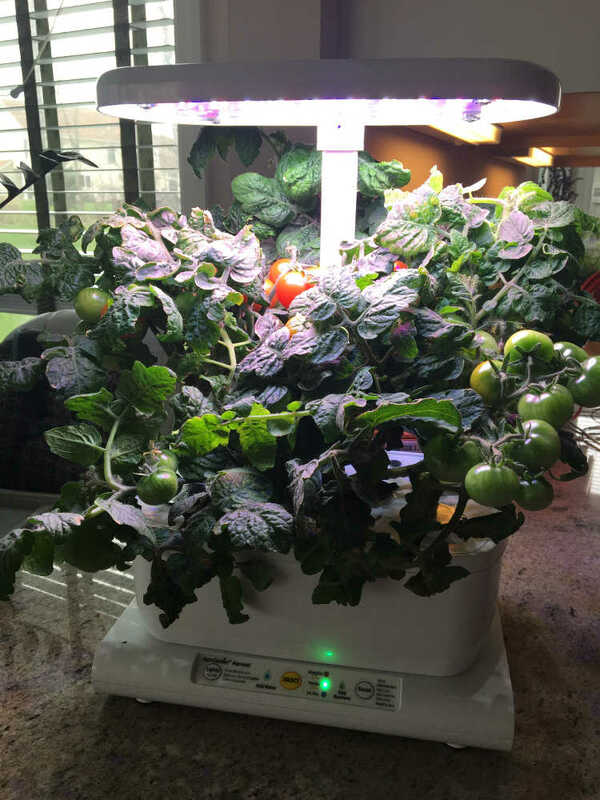 The AeroGarden is a hydroponic growing system, meaning that it grows in water instead of soil or growing medium. And it includes an LED light hood to provide all the light that plants need. I’d never used this type of system before, so I was excited to give it a shot. The AeroGarden comes in many different models, with three, six, seven and nine-pod designs. Pre-seeded pods are available for growing herbs and flowers, but also tomatoes and peppers. I picked up two fresh cherry tomato pods, dropped them in two of the slots of my six-pod model, filled up the tank with water, added liquid fertilizer and we were in business. Here’s how it went. Fresh tomatoes, dead of winter. Having something green growing in the house during the winter was amazing. And having the scent of tomato leaves to sniff on was fantastic. I had the first ripe tomato in 80 days. Decent taste. Now I’m waiting for the other more than 50 fruits on the plants to ripen. In April. In Ohio. I hope you like bruschetta! Great instructions. I’m big on reading instructions that come with products and the ones that come with the AeroGarden are pretty awesome. Of course, there are step-by-step instructions to get the garden planted up, but there’s also advice for the growing process. For example, there’s information on when and how to thin and prune (including illustrations!) and how to help pollination along. There’s even a product designed to help with pollination called the Be The Bee Pollinator. Watering and fertilizing alerts. Lights on the AeroGarden remind me when it’s time to water and fertilize. If you have one of the WiFi models, the unit will send an alert to your smartphone when your plants need watering or fertilizing. I wish all my plants would do this. My AeroGarden on day 81. Getting ripe. Missing variety information. I’m wondering what variety of tomatoes are preloaded in these cone-shaped cartridges. For other types of herbs or flowers, it might not be such a big deal, but I want to know if these are determinate or indeterminate tomatoes. There’s no mention in the instructions on how to know when plants are done producing. There is the option to choose your own seeds to plant with the Grow Anything pod kits. You buy empty pods and grow any seed you like. Built-in staking. One of my tomato plants toppled over before any tomatoes fully ripened. It didn’t snap off or break, so I was able to stake it to the post holding up the LED hood. Nice. Bright lighting. One thing I hadn’t considered was the LED lighting included in the hood above the garden. It’s bright! I originally thought I would have to move it to somewhere other than my kitchen counter, but we adjusted to the brightness pretty quickly. For a beginner gardener, the AeroGarden is a great learning experience. 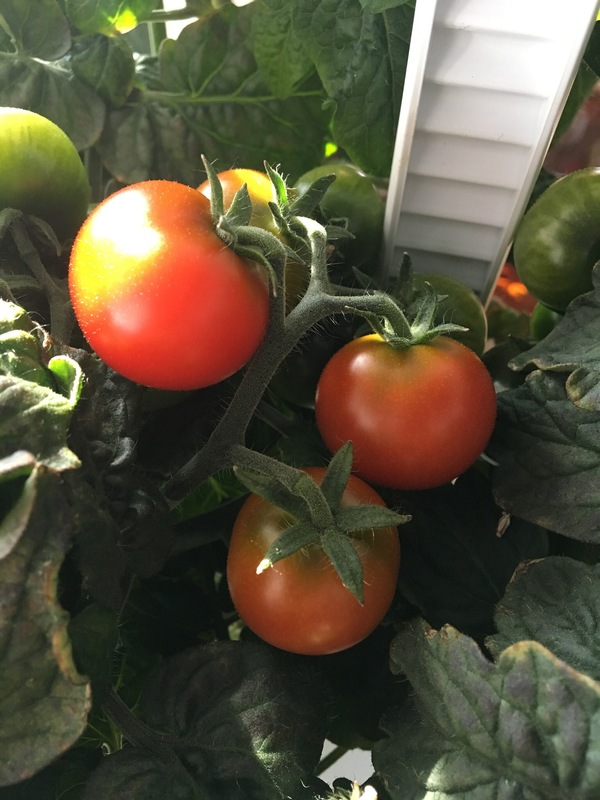 I learned a lot up-close about the lifecycle of these tomatoes, including how much light and water they really need and how important pollination is. If you follow the instructions and the unit is operating properly, you can’t go wrong. People have been amazed to see tomatoes growing inside and on such a small footprint. It makes me look like a gardening wizard. People have been amazed to see tomatoes growing inside and on such a small footprint. It makes me look like a gardening wizard. When these tomatoes are done, I’ll be growing some herbs: basil, parsley, cilantro, mint and dill. Can’t wait. Those tomatoes are looking great. Really looks like a fun system.